What is Physical Therapy? By definition, physical therapists “preserve, enhance, or restore movement and physical function impaired or threatened by disability, injury, or disease”. This is typically accomplished by utilizing therapeutic exercise, physical modalities (such as massage and electrotherapy), assistive devices, and patient education and training. However, this definition is very vague and the application of physical therapy can vary tremendously. Traditionally, physical therapy is associated with outpatient clinics where people go if they experience a sports injury, common ailments associated with the aging process (including low back pain) and recovery from surgery (like a knee replacement). Since the field of physical therapy is quite broad, therapists often specialize in an area of interest including: women’s health, orthopedics, pediatrics, neurology, and vestibular rehabilitation among other areas. Additionally, therapists can work in a variety of settings including hospitals, outpatient clinics, rehabilitation facilities, homes, nursing homes, schools, athletic facilities, and fitness centers. Because the field of physical therapy is so wide it can be tremendously difficult for a patient to navigate and choose the best physical therapist to meet his or her needs. For example, a new patient of ours at the International Neurorehabilitation Institute (INI) recently commented that they “have never experienced physical therapy quite like this before.” The patient went on to explain that her previous experience with “ physical therapy” included her therapists treating multiple patients at once and being given “generic” exercises for only 30-60 minutes. The type of setting that this patient was describing is not bad per se (it is what most people think of when they hear the expression “Physical Therapy”); rather, the model of care is simply does not come anywhere close to what is needed by the patient population that comes to us at INI. 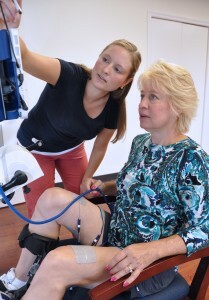 At INI we believe that people with neurological injuries (including Multiple Sclerosis, Transverse Myelitis, Cerebral Palsy, and Spinal Cord Injury) require intensive, specialized therapy. Subsequently, our therapists utilize activity-based restorative therapy (ABRT) to promote neurological recovery by stimulating the nervous system above and below the level of injury through intensive activity. Our highly-trained therapists use many different techniques to achieve this important stimulation of the nervous system, one of which is the use of functional electrical stimulation (FES). Patients at INI often receive one to three hours of physical therapy depending on their specific needs. All sessions are one on one, patient to therapist, and include specific interventions that are tailored to the patient’s needs. There is nothing “generic” at INI or with neurological injuries/diseases. Therapy for nervous system disorders must be individualized and therefore treatment at INI is never your “average” physical therapy. Additionally, we teach our patients how to continue their programs at home so that neurological recovery and rehabilitation is a lifelong partnership. To schedule an appointment or for more information about our ABRT physical therapy treatment programs at INI you can call: 410-828-4629.